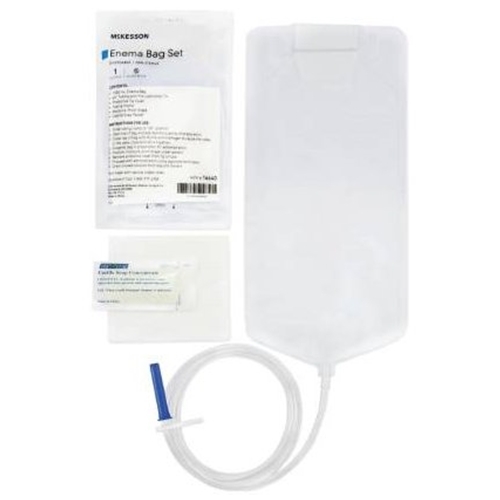 McKesson Enema Bag Set from HealthyKin.com is designed to aid in patient colon health and help maintain digestive well-being. The 1500 mL enema bag features vinyl tubing with a prelubricated tip, as well as a castile soap packet, which serves as a soothing agent. Graduated scales and the translucent material help facilitate accurate measurement of fluids. The adjustable tubing clamp moderates the amount while the drape minimizes the moisture. There are quite a few enema bag sets out there. This is the best. Very reasonable price & great service. From now on, my go two company. Get it ? "Go Two". Great product & service. Consistent quality at a reasonable rate. Well made, easy to use and great price. Shipping rate rather high.